ORCHARD SUPPLY HARDWARE UPDATE We are sad to see the closing of all 99 OSH stores - a 55 year EDFRED partner! Please check your local Ace & True Value hardware retail stores. Watch for our improved and updated retail locations finder for more options - just CLICK HERE TO FIND A LOCAL STORE. This site is certified secured and financial data is encrypted by GeoTrust®, then deleted when your transaction is complete. We are a family owned manufacturer of high performance professional cleaners since 1964. See what others are saying in the customer reviews, and please post your own experience. You may visit our corporate website , and our blog for product discussions and "how to tips". Just for fun check out this YouTube Video of one of our happy customers. I bought my first bottle back in 1996 from OSH. My project was cleaning up a fixer upper with fiberglass showers and tubs. The salesman at Osh really pushed me to buy it. That was the best thing I did to start getting the house in shape. I'm on my 3rd home now and just ordered more to get rid of the water spots on the shower glass. 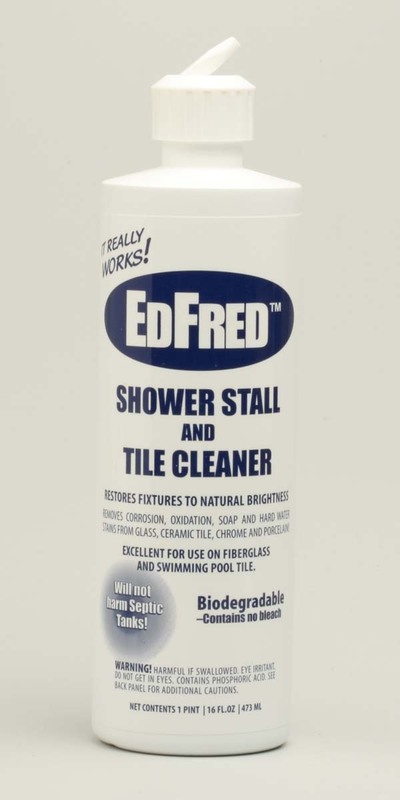 This the only cleaner I use for showers and toilets. I have also used on the portable spa we have. I had drained and let it sit got really ugly inside. One wash with ED Fred and all the lime was gone from the tile. Thanks for such great products.